Welterweight world champion Errol Spence Jr.received a champions' welcome in his hometown Wednesday at Dallas Cowboys World Headquarters at a press conference to discuss his homecoming defense Saturday, June 16 live on Showtime against unbeaten Carlos Ocampo at Ford Center at The Star in Frisco in an event presented by Premier Boxing Champions. "This is a big opportunity for me. This has been a lifelong dream of mine. I can't wait to fight in front of my hometown fans that have been rooting for me since the amateurs. It's great to bring this event to Ford Center. I'm happy to defend my title against a great contender like Ocampo and I hope everyone comes out and supports their champion. "I don't think there's any extra pressure fighting in my hometown. It's just added motivation. Real pressure was fighting against 30,000 fans in the champion's hometown for my first title against Kell Brook. This is me fighting in front of people who love me and who have seen me grow up as a boxer. I can't wait to put on a show for them. "Everybody poses a challenge in the ring. Ocampo is tough. He's young and this is something he's been fighting for his whole life. I know he's coming to fight. Mexican fighters have a great tradition. They come to fight and they don't back down. I know he's going to give it his all and that gets me motivated. "My motto is 'Man Down' and I have to live up to it. I don't go in looking for the knockout, but I let it happen naturally. I let it come to me and we're definitely going to let it happen on fight night. "I feel like I've definitely earned this hometown fight. To go to another country and fight a champion in his hometown, and to win the belt, I think I deserve to defend my belt in front of my fans. "It's going to be a great feeling being at this venue on fight night. When I was a kid, I thought I was going to be playing for the Cowboys. So this is just going to be a wonderful opportunity. I've already talked to a lot of Cowboys players who are excited to come see me fight. "I do believe I'm the best welterweight in boxing right now. I've been trying to prove it for a long time. I'm never looking past anyone, but I'd love to fight Danny Garcia, Shawn Porter and when he's back, Keith Thurman. I'm ready to fight the best in the division and prove I reign supreme over all of them." "I know that this is a great opportunity to be fighting here in Spence's hometown. That's a plus for me and it motivates me. I'm going to be ready to fight for 12 rounds. "It's supposed to be tough with the crowd against me and I know I'm the underdog, but my mind is only on the fight. I'm just fighting one man, not a whole crowd. I know that I have what it takes. "Spence is a very smart and tough fighter, but he doesn't scare me. I've been working for this for too long and I will be 100 percent ready to win. I've had a very tough preparation and a very long camp. We've been sparring southpaws to prepare and so far everything has been smooth. 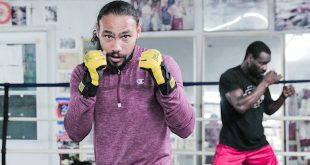 "Being here I am even more excited and more motivated to push hard these last weeks of training camp and come into this fight at my absolute best. I have been the underdog before and I'm prepared to once again overcome that. "I'm not worried about what anybody else thinks of me or this fight. My mind is only on winning and being prepared to do whatever I have to. He can talk about knocking me out all he wants but I'm here too and I'm ready to knock him out on June 16." "Being at home, this fight is going to be about Errol keeping his focus and staying task. He's always been able to do that. He's motivated and driven. He's the guy that you have to drag away from the gym. "I never looked ahead to moments like this with Errol, from the beginning we just grinded away day by day. I was focused on enhancing his skillset and that's what we're still doing to this day. "I'm able to keep my feelings bottled up until after a fight, because being at home there can be a lot of distractions. But of course, this event being here in Dallas is phenomenal. I'm most excited that my two daughters will be able to come to the fight. "Errol has been training extremely hard like he always does. On the first day of sparring he did 15 rounds with [WBC 154-pound champion] Jermell Charlo and [unbeaten light heavyweight] Adrian Taylor. "The two of us just have to stay focused and everything comes naturally. It's going to be a great show for this city and a great night for Errol." "Showtime is the home of the biggest fights and brightest stars in boxing, so we are particularly thrilled to be here at the home of the best professional franchise in sports, the Dallas Cowboys. We're proud to be bringing the first boxing event ever inside of the Ford Center and we can't wait to show off these facilities on Showtime in June. "This is the first world title fight in Dallas in quite some time and I can't think of anyone better to bring that here with than Errol Spence Jr. It's fitting that the NFL Draft was here last week, because I think that if boxing had a draft, there's a good argument Errol Spence Jr. would be the number one pick. "He's top pound-for-pound champion, he's a popular draw and he's in boxing's most talent-rich division. He has the 'Trainer of the Year' in his corner and has won 10 straight fights by knockout, from contender to champion. That is the sign of a truly great fighter. "The great thing about boxing and for Carlos Ocampo, is that none of those accolades matter on June 16. Rankings, opinions and belts don't matter. It's just two guys in a ring and only one man will win. He's spent his whole life working for this opportunity and I believe that will make this an exciting event. "As a Texas-native, I know that Dallas is a football town, it's a good town for all sports but at its heart, Dallas is a football town. But I have great confidence that on June 16, Dallas will be a great boxing town as well." 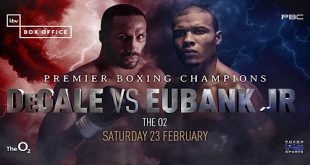 "With IBF Welterweight World Champion Errol Spence Jr. making his homecoming debut at this great venue, the Headquarters of the Dallas Cowboys, I know that this is going to be a hot ticket and one you'll want to purchase right way. "A lot of hard work went into getting this event together at this great venue and we're thrilled to be working with the team here at Ford Center to bring it to the fight fans of this city. "Errol Spence is one of most talked about fighters in the sport. Many consider him the best welterweight and perhaps the best fighter in the world. He's also made it known that he's willing to prove that and fight the best in the division. But he can't afford to look past this young undefeated challenger from Mexico, in Carlos Ocampo. He's fought his whole life for this opportunity and is here to make the most of it. 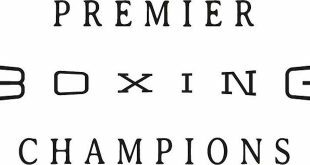 It's going to be a great night and a great homecoming for Errol Spence Jr. on June 16." "These are two really special young men on this stage and this is the kind of event that we had in mind when we opened The Star. To be able to have great athletes like these as part of unique events at The Star is something we're very excited about. "We like to create versatility for this venue and we want to bring all types of sporting events here. This doesn't happen without the city of Frisco and the Frisco independent school district. We're also honored to partner with TGB Promotions and Premier Boxing Champions for this groundbreaking announcement. "It's known how energetic the sport of boxing is, but to be able to host Errol Spence Jr. and have him represent our city will be an unforgettable experience for all. 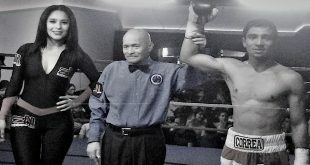 Carlos Ocampo is a quality opponent who is also unbeaten. I admire both of you men and I look forward to watching you on June 16."